The public perception of entrepreneurship can have a strong influence on people’s desire to become entrepreneurs. In countries where entrepreneurship is held in high regard, the overall rates of entrepreneurship are correspondingly high. 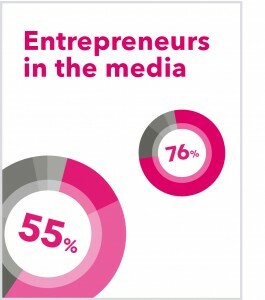 The media have an important role to play in shaping the public perception of entrepreneurs and the startup process. It is therefore important that they understand the impact of their programming and their responsibility to ensure that the portrayal of entrepreneurship is reflective of reality. The two most prominent TV programmes about entrepreneurship, Dragons’ Den and The Apprentice, project an inaccurate representation of entrepreneurs and the startup process. As shown below, a YouGov survey commissioned by the Centre for Entrepreneurs found that 61% of small business leaders thought The Apprentice “off-putting” for aspiring entrepreneurs and that 88% thought that contestants were chosen to appear because they would make good television, rather than because they offer credible investment opportunities. This negative and inaccurate portrayal of entrepreneurs is disconcerting because it could result in a negative impact on the uptake of entrepreneurship. In response to these findings, the Centre for Entrepreneurs is calling upon the media to provide a more realistic portrayal of entrepreneurs and the startup process. Entrepreneurship in Britain is diverse and thriving; it is transforming industries, communities and culture, and it is time for media representation to reflect this. We are working with successful entrepreneurs and third sector organisations to get media coverage for a broader representation and greater number of entrepreneurs.